The device contained no explosive content, and was similar to the kind used in military drills. A DUMMY GRENADE sparked a bomb scare close to Heuston Station in Dublin city centre this afternoon. The false alarm sparked road closes and Luas stoppages around the Station in Dublin. An army bomb disposal team arrived at the scene at 2.40pm, but had declared it safe within 20 minutes. 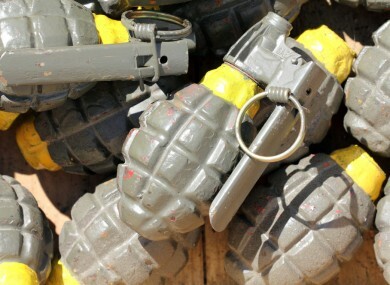 A Defence Forces spokesperson said the device was similar to those used in military training, is weighted and similar in appearance to an actual grenade. However, it contained no explosive material. Earlier reports that the device was a live grenade from the War of Independence were inaccurate. The spokesperson added that the members of the public were still right to have contacted emergency services about the suspicious device. Full Luas Red Line has been reopened following earlier disruption. Dublin Traffic - Heuston Bridge re-opened. Traffic diversions have been lifted. Luas running as normal. Email “Dummy grenade sparks bomb scare close to Heuston Station”. Feedback on “Dummy grenade sparks bomb scare close to Heuston Station”.